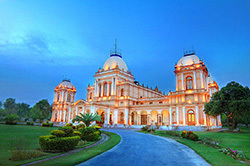 Bahawalpur, the 12th largest city of Pakistan and an important city of southern Punjab is famous for its tranquility, cultural heritage and educational institutions. It was once the capital of former princely state of Bahawalpur, founded by Nawab Bahawal Khan Abbasi II. This remained an autonomous state for over 200 years. During the rule of last Nawab Sir Sadiq Muhammad Khan Abbasi V, the state acceded to Pakistan on 07 october, 1947 and merged into the Punjab on 14 October, 1954.